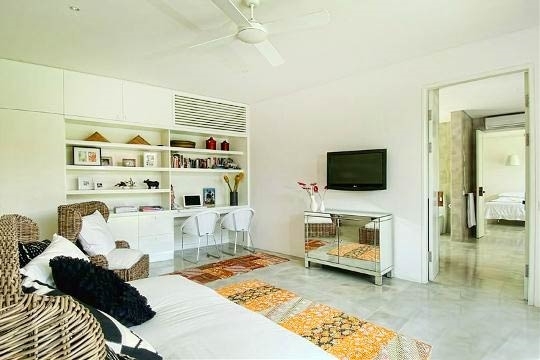 Chic, private and very central, this 3-bedroom oasis is fresh and functional in design. 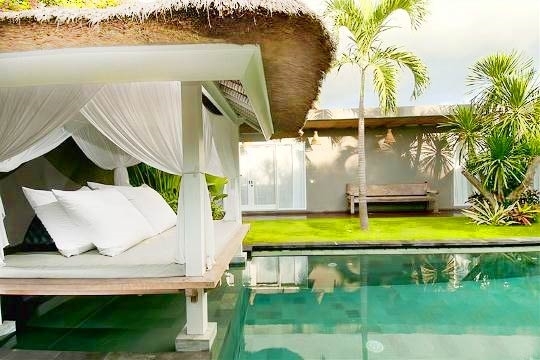 With amenable staff, a stylish pool, perfectly appointed living spaces and beautiful bathrooms; Villa Mimi is a hop, skip and a jump to the heart of fun-filled Seminyak, and delivers great value to boot. 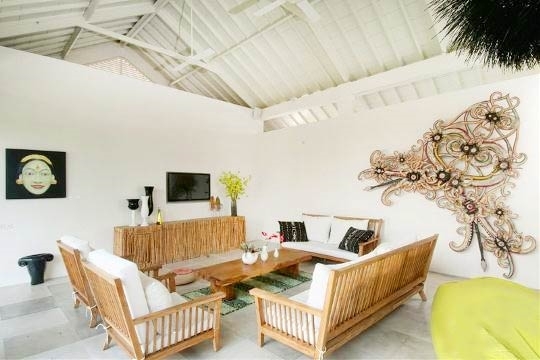 Villa Mimi captures the essence of Seminyak’s jet-set style spot on. 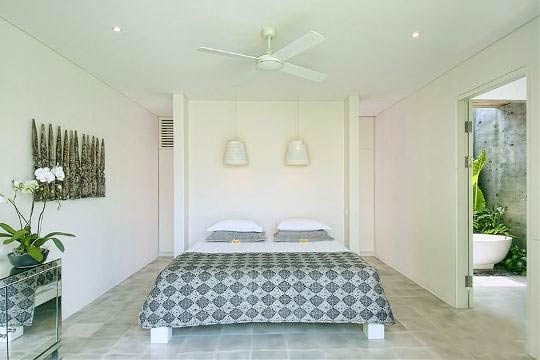 The owner-manager has created a very stylish villa with a youthful vibe, but one that is also in harmony with nature; a winning combination that many modern holiday villas fail to achieve these days. A thread of sophisticated ethnic and modern design touches are woven throughout the property both inside and out and are set against a calm background of dove grey and eggshell, livened up by just the right amount of eye candy: two oversized hanging metal lamp sculptures pop in the living room, ten contemporary white rattan and chrome dining chairs are tucked around a Scandinavian inspired, recycled teak dining table and trendy black bean-bag chaise longues and umbrellas complement each side of the sleek 15m swimming pool. 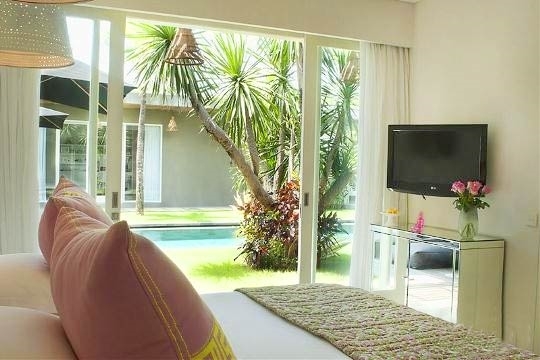 The villa layout is flexible and works well for up to three couples or groups of friends who want to experience Seminyak together in style, yet each with their own private suite. Families will approve of the adaptable sleeping configurations, as well as the open living and dining areas surrounding the pool (although don’t expect to play football in the minimalist garden) and seniors will appreciate the single-level floor plan. Villa Mimi is not overly staffed, but the team do offer just the right amount of tender loving care. One of the housekeepers also happens to be rather talented in the kitchen, and although she goes off duty at 4pm, she will happily prepare supper for you in advance. The first breakfast is included in the villa rate and there’s a concise, yet diverse suggestion menu with a few yummy desserts such as apple crumble and ice cream thrown in for good measure (ingredients are charged to guests at cost plus 10% shopping fee). Alternatively, jalan jalan (take a stroll) over to Seminyak’s famous ‘Eat Street’, to experience in person why millions of travellers choose Bali every year. Getting to and from the villa is no problem as airport transfers are included, and for jaunts around the area there are more than enough taxis nearby to whisk you where you want to go at minimal cost. 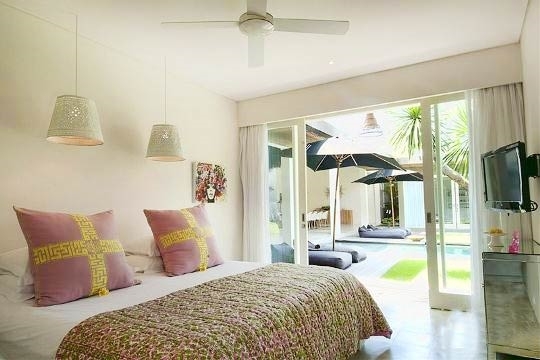 Chic Villa Mimi captures the essence of Seminyak’s jet set style spot on. You can always tell when an owner has designed a villa for him or herself and not just to turn a profit. Villa Mimi has that clean, chic, trendy Seminyak sense of place that screams contemporary Bali style, yet also manages to feel like home. The villa’s charm and functionality make for a great long weekend getaway or a home base for the summer. 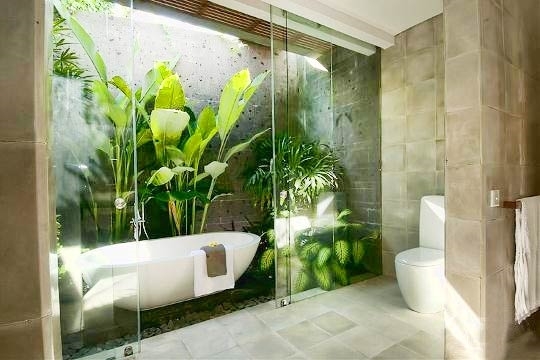 This little gem works very well for Bali visitors who want to be in the thick of things, yet covet privacy and an interesting architectural aesthetic. Although the media room could use a larger, comfier couch, we liked the thoughtfully framed personal photos that give a glimpse of the owner’s passion for life, and the big book selection. I soon found a collection of short stories written by a long-time Bali expat about her quirky life on the island and sank into one of the bean bags by the pool as Nur the housekeeper delivered French press coffee in eclectic mismatched china. My favourite quote captured the essence of our stay at Villa Mimi, “Those in synchronicity with Bali are among the happiest people I have ever known.” As the afternoon lazed on, Nur checked in about ordering dinner. We sheepishly asked if she would be willing to make soto ayam, an Indonesian twist on chicken noodle soup (which wasn’t on the menu). Without hesitation, she hopped on her motorbike to grab the ingredients and within an hour, we had a healthy, steaming lemongrass broth simmering on the stove and bowls of rice noodles topped with sliced chicken breast, green onion, bean sprouts and wedges of lime. Ask and you shall receive! Villa Mimi is so centrally located that you don’t need a car and driver. Just 500m away you have ‘Eat Street’, one of the most popular avenues in Seminyak buzzing with taxi cabs waiting to take you anywhere for a reasonable fee or just stick around the neighbourhood where you’ll find more restaurants and shops than you’ll know what to do with. This villa doesn’t boast a fancy façade, so don’t judge a book by its cover. 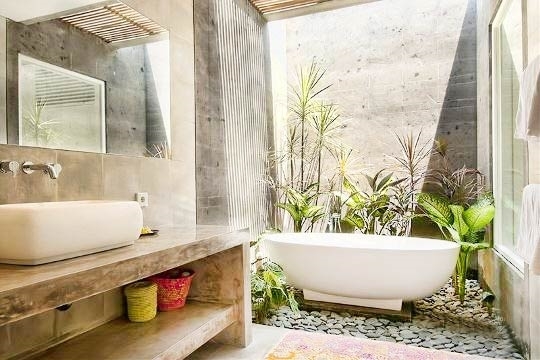 But once you step through the solid wood front doors, Villa Mimi will tickle your fancy with a trendy, yet down-to-earth globetrotting vibe that’s exactly what Seminyak‘s all about. 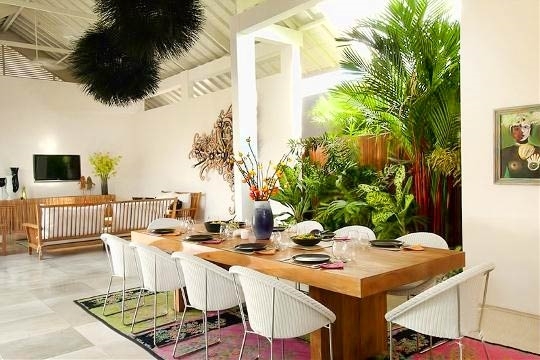 Villa Mimi rests in the heart of bustling Seminyak, 100m from Vienna Café (a charming garden café and bakery known for tantalising Austrian home-style pastries) and within a five-minute walk of La Sal, Bali’s best Spanish restaurant. 500m from the villa is Jalan Laksmana, recently renamed Jalan Kayu Aya but more appropriately known as ‘Eat Street’ due to an abundance of international restaurants including Café Bali which has been a loyal staple for both expats and visitors since 2007. Numerous designer boutiques also line the street, including Ibiza inspired ‘Uma & Leopold’ and sultry French designer ‘Magali Pascal’. Here you will find everything from red-carpet Champagne bars and uber-cool surf-chic boutiques to health food enclaves featuring raw food delicacies. 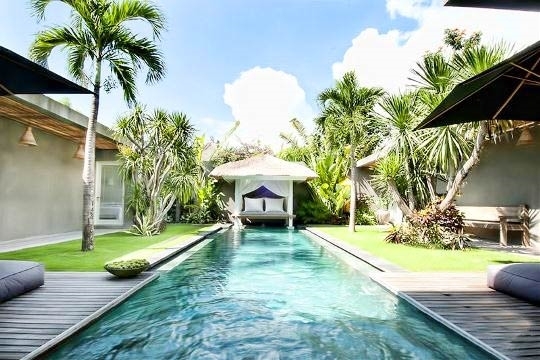 Designed in an easy breezy u-shape around the pool and the small but well-manicured tropical garden, the indoor-outdoor lifestyle that has made Bali famous is perfectly executed throughout Villa Mimi. The living room boasts soaring ceilings, a 47-inch flat-screen TV, surround-sound Bose stereo and ample seating for the whole group on a generous L-shaped couch and ottoman. The fully-equipped kitchen has everything guests need to prepare meals including a generous oven and some cooking basics such as spices in the pantry. It is also air-conditioned which is a nice little bonus. All three air conditioned bedrooms enjoy views of and direct access to the pool and are equally well-appointed. The rooms feature king-size beds (one of which can be converted to twins), 32-inch wall-mounted flat-screen televisions, international channels, DVD players, playful bed linens, colourful rugs sourced from popular local boutiques and contemporary touches including mirrored TV cabinets and whitewashed tin lights over the beds. 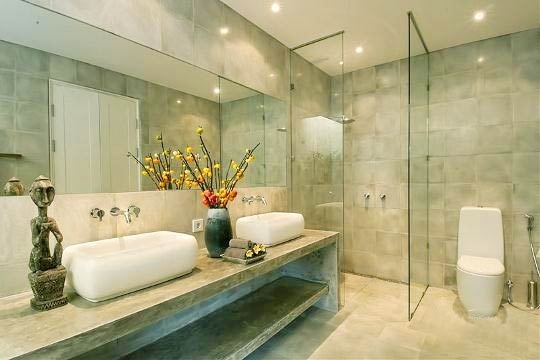 The villa’s ensuite bathrooms exude a minimalist spa sanctuary aesthetic, with modern polished-concrete floors, sleek soaking tubs, walk-in rain showers, potted orchids, oversized lavatories and private mini-gardens. The simple, but fun media room features a large pop-art-style canvas and is equipped with up-to-date magazines, a decent book collection, and more than enough DVD’s to last through the holiday. This room features a sofa bed (suitable for one child) and has access to one of the bathrooms. Although the grounds are not overly large, the space is well thought out, offering several different lounging areas to choose from including twin wooden pool decks with two loungers each and, at one end of the pool, a Balinese-style gazebo with traditional grass roof, overstuffed pillows and romantic draped netting – perfect for an in-house massage or afternoon siesta. 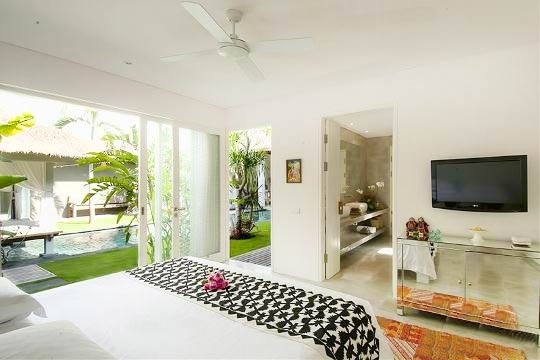 3 bedroom villa located in Seminyak, Bali. Ideal for Beach in ten, Body and soul, Fair share for groups, Sensible for seniors, Walk into town.